Shortly after I started at Songtrust and during the early conversations I had with candidates for roles on our team, we talked about how we would speak to the creative community about why it might make sense for them to work with us. Much of what brought me to Songtrust was the chance to be a part of an organization that gives access to an area of the business long made mysterious and seemingly unavailable to a large swath of songwriters and producers. The fact is that, by law, simply by having recordings of their compositions in distribution earns them royalties. Yet it can seem nearly impossible to access these royalties due to the complexity of the global rights system. This unfairness is something that motivates me every day. In my many conversations during my first year, I made the effort to help the person I was speaking with to understand what we do visually. Songtrust exists to connect the rightsholder of the composition of the song (the writer, producer, owner of that copyright) with the revenue by which it is experienced - radio, streaming service, live performance, film or tv broadcast - and all the other nuanced ways publishing royalties are earned. We are the global, cloud-based connection between the creative work and the individual who hears it. While not easy, every day we hear from our clients about the positive impact this access we provide has on their careers and it gives our team incredible energy towards what we’re doing. The results of this motivation are abundantly clear - by the end of 2018, we’ll have 100% more new clients working with Songtrust than we did the previous year, administering publishing rights for nearly a million and a half songs. 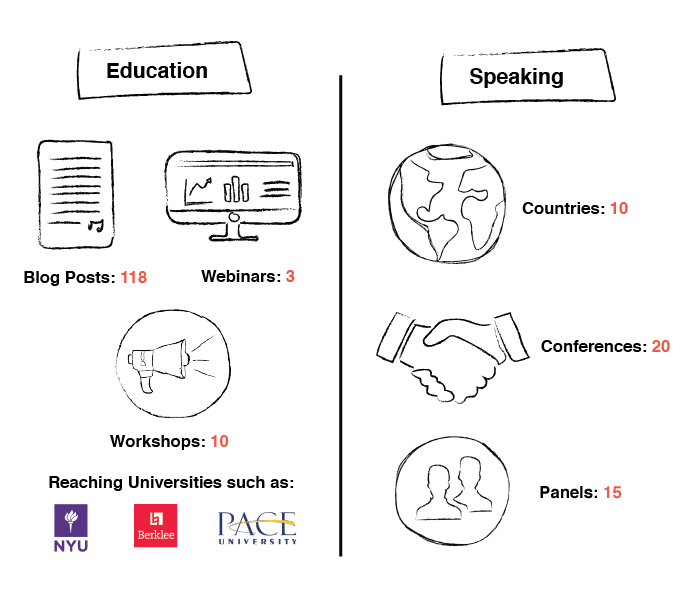 In order to reach these new songwriters, producers, and other rightsholders, we’ve written roughly 118 unique blog posts, run three in-house webinars, presented on over fifteen panels at twenty conferences in ten countries and held more than ten workshops at colleges and universities like NYU, Pace and Berklee. Our topics are wide-ranging but our goal is to offer a blend of tactical advice for creators like Kato and Emma McGann, focused analysis on issues impacting our community on a macro level like the MMA and streaming payouts, and evidence of success to inspire and encourage like our client profiles of Marsheaux and Drvmroll. It’s tremendously exciting to see the development of this work over the course of the year and the way it’s resonating with the music community. This is giving us even more focus as we prepare for 2019. One of the main areas we’ve been so pleased to see grow is our work with independent publishers and labels and who are able to grow their company’s offerings through partnering with us and our cloud-based technology platform for global music publishing administration. 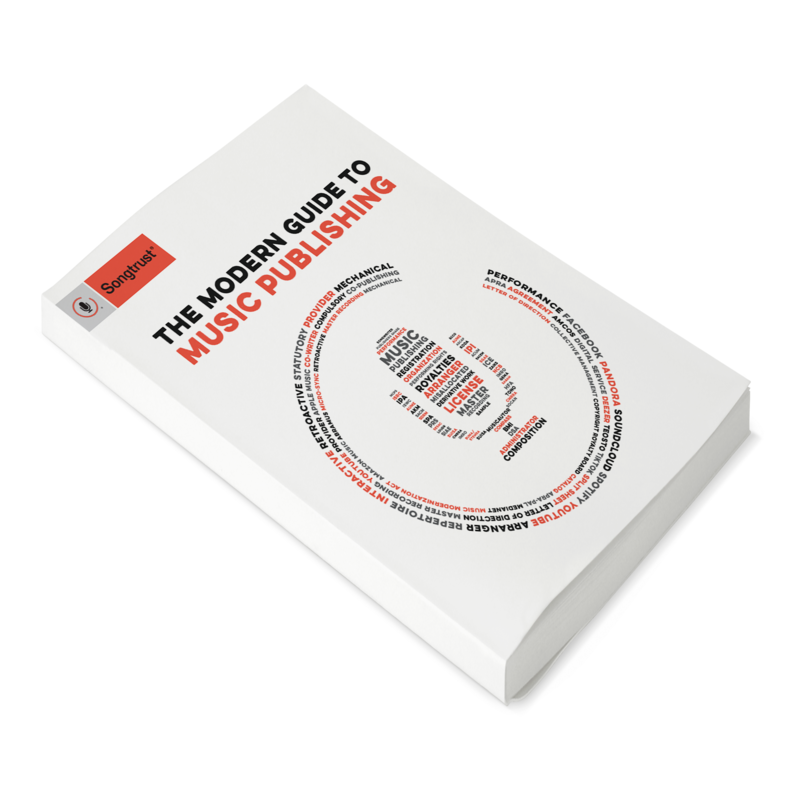 Companies like Sync Daddy, Arow Agency, La Chunga Music Publishing, Kill Rock Stars and songwriters like Lele Pons, Todd Terry, Jeremy Zucker, Thursday and many more are now able to focus on what they do best, and allowing us to handle the “painful parts of publishing”. Making sure every “i” is dotted and every “t” is crossed when the work they represent is sent through our system to our global network of over 50 collective management organizations, digital service providers and other agents of royalty collection and administration is just one of many moving parts. Songtrust’s commitment to direct affiliation is giving our clients access to the most expedient, frictionless and least number of layers, and we’re laser-focused on continuing to optimize this. We measure our success by two main things: time-to-delivery and time-to-royalties. Time-to-delivery is the amount of time it takes to deliver the catalog of works on behalf of our clients to our global network; Time-to-royalties is the amount of time it takes for us to pay out to our clients the royalties they’ve earned. Neither of these things are easy and we will never stop aiming to improve. To that end, we’ve expanded our team significantly this year, not just in sales and marketing, but also across product, engineering, and operations. This is the most ambitious, critical and aspirational team I’ve ever been a part of and, while we all have a deep sense of pride in what we’ve accomplished this year and how much we’ve grown, the upcoming year is causing many of us to wake up wondering which stone we’ve left unturned as we plan more education initiatives (get ready to be Songtrust Certified! ), outreach to creative communities in all areas of the globe and in all genres, and continue to grow our team in a way that is both responsible and ambitious. At the one-year anniversary mark of my time here I feel like I’ve got a grasp of what we can do and a very clear path on how we can do it.